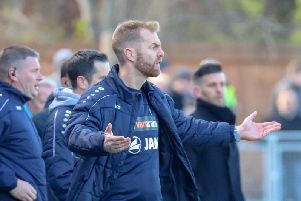 Harrogate Town manager Simon Weaver has attributed George Thomson's recent fine form to the player's "professional" attitude. The 26-year-old winger has netted four goals in his previous seven starts, the most recent of which was the decisive strike in Saturday's 3-2 victory at Dover Athletic. "It just fell nicely for him to strut his stuff and show what George Thomson’s about with that incredible strike that left the keeper helpless," Weaver said of the effort that lifted his team back into the National League play-off positions. "He's a proper talent, that's for sure. He looks after the ball for us and he's getting on the end of stuff. "“I’m just really pleased for George because whatever you throw at him - sometimes he’s had to be left out to have a breather - he’s stuck to his task. He's such a great lad. “He’s one of the first players out there in the morning for training and one of the last to leave, and you want that kind of mentality running through the club. “His professionalism is second to none. He lives his life the way it should be as professional footballer and he’s also got a lot of talent." Having been switched from his usual position on the right of Harrogate's front three to the opposite flank following the arrival of debutant Dylan Mottley-Henry from the substitutes' bench, the ball dropped to Thomson in somewhat unfamiliar territory with just moments of Saturday's contest remaining. The Town number seven was however able to cut inside and onto his favoured right foot before picking out the far corner of the Dover goal with a glorious finish. "I just remember the sound of it more than anything. It was a thud - he’s got a great strike on him," Weaver added. "It was a spectacular effort, a memorable one and hopefully that magic moment can lift us on to better things now."